Live-streaming took center stage in Baltimore, Ferguson, New York, and Cleveland as hot-button issues exploded. Here are five ways to get ready for when your client has to deal with it. A protest at a Baltimore Police Department building. (Image via Wikimedia Commons). 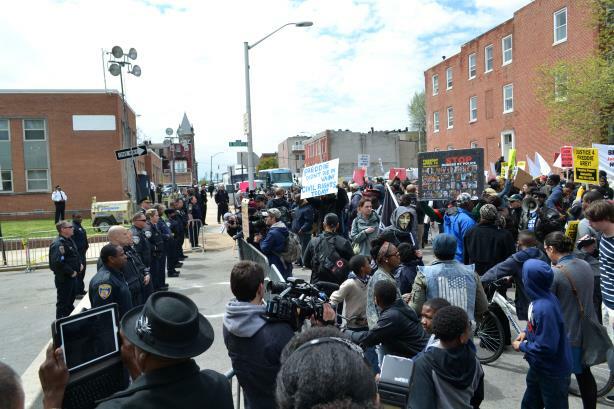 It was front-and-center in Baltimore last week, as it was in Ferguson, New York, Cleveland, and other communities grappling with social unrest. Live-streaming is becoming an increasingly prominent tool to engage followers in real-time and to supplement TV and online news coverage. Truth be told, peaceful protests and rallies of all stripes are actively live-streaming their events, as well, but cable TV news pays no attention. Still, live-streaming by citizen reporters can provide an instant and immersive stage to challenge our clients, whether they are companies, colleges, or government agencies. Smart crisis managers must anticipate the use and power of live-streaming, particularly if the focus is on an emotionally charged social issue. Just when you think it won’t happen to your client, it will. Live-streaming via Ustream and YouTube, or with new mobile apps such as Periscope and Meerkat, has only increased the ease with which a person can stream content in real time and in HD, as well as broaden audience reach. Throw in a videographer who is also a good narrator, and live-streamed video can be riveting. Viewers are sucked into it, often for affirmation of their views or for simple voyeurism. They will also engage, promoting the feeds, tweeting their observations about the live coverage, and influencing sentiment on the spot. When developing a plan, a crisis manager has to devise a strategy and compelling narrative that can neutralize a video live-streamed by the other side. Otherwise, you and your client may find yourselves playing a losing game of catch-up. Your own live-streams can certainly help, assuming other efforts have built an audience. Take a cue from the sophisticated mobilization and communications tactics used by activists. Live-streaming has never been the sole means of audience engagement for the Occupy movement or for those seeking — or opposing — racial equity, freedom to marry, immigration reform, or GMO labeling. Twitter, Pinterest, Vines, Wickr, YouTube, and Facebook all support on-the-ground organizing, as do community radio, newspapers of color, and small group meetings. These are all tools crisis managers should integrate into a response plan. Crisis communicators are experienced in counseling and training clients for live-event coverage. We know how to play the field with the so-called traditional media. There are parameters, actions, and expectations we all follow. But when anyone with a smartphone can be a citizen reporter, streaming a CEO confrontation, outraged customers, or overzealous security personnel to a significant audience of supporters, it gets tricky. Here are a few tactics to consider. Treat citizen reporters with the same respect and dignity as you do mainstream media. Expect that every live-stream has an audience as large and powerful as live local TV. This mental preparation keeps you on your toes. Prepare for biased, alarmist questions and unexpected reactions, as well as instantaneous, vocal opposition. Practice how to keep cool under pressure. And this includes your staff. No smirks or eye-rolling or disparaging comments. Don’t take the bait. Have a clear path for a quick but appropriate exit if the interview turns sour. Some citizen reporter will not let you walk away quietly. Learn from archived live-streams and those streaming in real-time. They provide rich information that can help you refine your actions and audience-centered messaging. As crisis managers, we are pursuing the best possible outcome for our clients, while helping to prevent the worst. With live-streaming, the worst might be a little more accessible than usual. But if you’re ready for it, a crisis plan and well-trained clients can roll with the situation and use it to their advantage. Bob Gagne leads the crisis management practice at Minneapolis agency Exponent PR. He recently worked with St. Louis University to manage communications during the unrest in Ferguson.